Diamond & Fancy Wedding Rings There are 36 products. A hand finished 4mm court wedding band engraved I love you with a round brilliant cut diamond secretly hidden on the inside of the band. Total diamond weigh 0.03cts. This wedding band is available to order in a variety of precious metals. Each bezel set in a little cup of its own, the ten round brilliant cut diamonds in this 3mm sculpted band are virtually as wide as the ring itself. It is hand-made to fit your finger size so the price and diamond weight may vary. This one is size M and made in platinum but it can be ordered in yellow and white gold too. Please contact us for details. An elegant platinum diamond wedding ring grain set with seventeen round brilliant cut diamonds. Total diamond weight 0.17ct. A very lovely diamond ring which can be worn as a wedding ring or eternity ring. Also available in gold. A platinum ring channel set with princess cut diamonds. Total diamond weight 0.20cts. It can be worn as a wedding ring or an eternity ring. A hand finished 3mm wedding band flush set with twelve evenly spaced round brilliant cut diamonds. 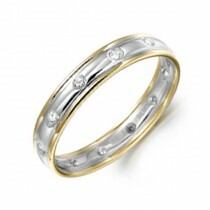 This wedding band is available to order in a variety of precious metals, colours and purities. 18ct white gold 3mm wedidng band with beaded lined detail. This ring can also be order variety of widths and precious metals. A hand finished 5mm Jigsaw design wedding band by Bien. This wedding band is available to order in a variety of widths, precious metals, colours and purities. A hand finished twelve stone channel set crossover diamond wedding ring. Total diamond weigh 0.09cts. This wedding band is available to order in a variety of precious metals and diamond weights. A hand finished twelve stone channel set cut out diamond wedding ring. Total diamond weigh 0.16cts. This wedding band is available to order in a variety of precious metals and diamond weights. Shaped wedding band set with five flush set round brilliant cut diamonds. Total diamond weight 0.07cts. 18ct white gold. 18ct white gold pave set diamond wedding band. Total diamond weight:0.13cts. A hand finished twelve stone channel set crossover diamond wedding ring. Total diamond weigh 0.10cts. This wedding band is available to order in a variety of precious metals and diamonds weights.